Have you checked your smoke detectors recently? If not, you might want to. According to the US Fire Administration (USFA), over a third of all home fire accidents occur in homes with no smoke detectors, and the risk of casualties in a house fire drops by 50 percent if your home has a working smoke alarm. Smoke detectors can save lives, and like so many domestic appliances, they’re becoming increasingly smart. By choosing a smart smoke detector over a traditional smoke detector, you can take advantage of multiple innovative features and can connect to your home’s monitoring system, making your home safer and more energy-efficient. What Is a Smart Smoke Detector? A smart smoke alarm is a device that can communicate with your home security system when the device detects the presence of smoke. By utilizing connective technology, smart smoke detectors can be accessed through many mobile devices and apps, and allow homeowners to remotely monitor emergencies, receive notifications on home status, interconnect home devices, and even use voice commands to shut off the alarm. Choosing the best type of smoke detector for your home can be confusing, but it doesn’t have to be. Several types of smoke alarms are on the market, including ionization, photoelectric, and dual-sensor smoke detectors. Each comes with its own set of pros and cons, so it’s important to compare your options before deciding which type of smoke detector is best for your home. 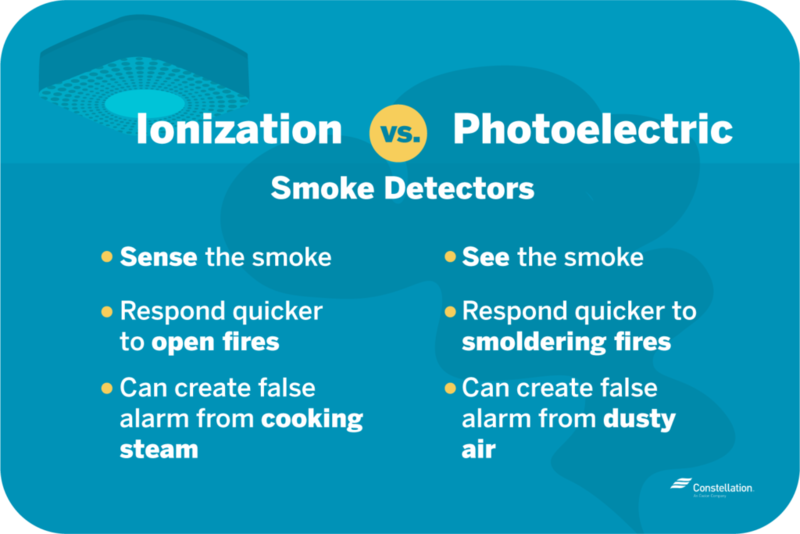 The debate over ionization versus photoelectric smoke detectors came about because the two smoke alarms detect smoke in slightly different ways. Ionization smoke detectors use radiation to detect smoke, but photoelectric smoke detectors use infrared light to see and alert of smoke particles. According to the USFA, ionization smoke alarms respond faster to the smoke from open fires than photoelectric smoke alarms, while photoelectric alarms respond quicker to the smoke from smoldering files. Ionization smoke alarms can produce false alarms due to cooking fumes or steam, while photoelectric detectors may sound off if they get dusty. Rather than pronounce one the best smoke detector, the USFA recommends that homes be equipped with both. Buying and installing two different types of smoke detectors isn’t necessary if you choose a dual-sensor smoke detector. Dual-sensor smoke alarms avoid the ionization versus photoelectric debate by including both types of sensor in the smoke detector. Some also detect carbon monoxide for additional safety. Dual-sensor detectors are susceptible to the same types of false alarms as both ionization and photoelectric alarms, but their ability to detect both smoldering and open fires outweighs this disadvantage. 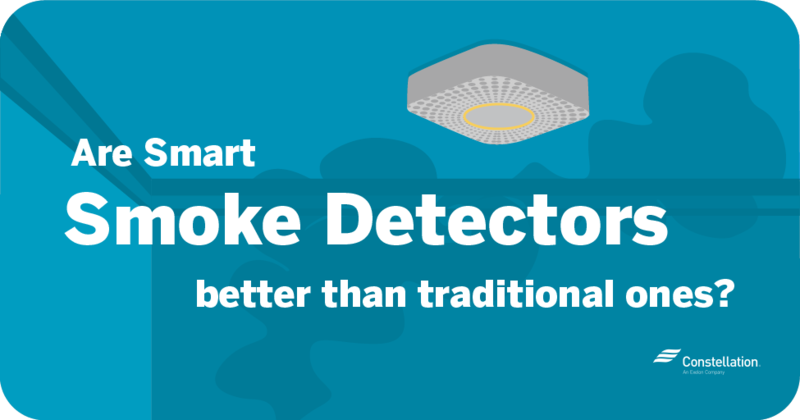 Not all types of smoke alarms offer the same features, especially when comparing smart detectors to traditional models. Do you choose a hardwired or battery-powered alarm? What about voice control or remote accessibility? Here are some of the features you need to consider when choosing the best smoke detector for your home. Decide on a hardwired versus battery-powered smoke detector. A smart smoke detector may be hardwired into your home’s power supply, while battery-powered smoke detectors are just that—smoke alarms powered by batteries. When you’re considering hardwired versus battery-powered smoke detectors, maintenance and dependability are the most important factors. You must turn the power off to maintain hardwired smoke alarms, and installing hardwired smoke alarms often requires professional electricians. Battery-operated alarms can be installed quickly and be checked at any time. Battery-powered smoke detectors, however, must be regularly checked to ensure they’re operational—a dead battery makes the alarm useless. Hardwired alarms have a constant source of power, and many come with backup batteries to guard against power interruptions. It’s important to test your smoke alarms at least once a month. If no alarm sounds, it’s time to replace the alarm. According to the USFA, it is recommended that homeowners swap out old smoke detectors with newer models every 10 years. Receive remote notifications of any emergency in your home. Some smart smoke detectors send alerts directly to your smartphone. Doing so allows you to quickly alert emergency services to the fire, even if you’re out of town. Protect your home with interconnectability. Many of the best smoke detectors offer interconnectivity with smart home assistants and other smoke alarms, so if one detector goes off, every other smoke alarm in the house sounds as well. Interconnectability is more likely to be an option with hardwired versus battery smoke detectors, and is something many traditional smoke detectors do not offer. Find the source of alerts in your home with smart detection. If interconnected smoke alarms are linked to other smart household appliances through your home monitoring system, they can notify homeowners of the exact location of the fire, helping you avoid danger as you evacuate the premises. Stop false alarms with silence buttons. Every smoke detector carries with it the risk of false alarms. Dust can set off a photoelectric alarm while cooking smoke and steam can trick ionization alarms into thinking there’s a fire. Many smoke detectors come with a silence button to turn off false alarms, or give homeowners the option of silencing the alarm through connected apps on their smartphone or device. Consider light alarms for the hearing-impaired. Many smoke alarms rely on sound to alert people to fires, but an audio alarm may not be the best option for homeowners who have difficulty hearing. The National Fire Prevention Association (NFPA) recommends using strobe light alarms for alerting people who are hearing-impaired, and use specialized, high intensity lights to wake up homeowners as they sleep. Pro Tip: Light alarms aren’t the only option that could benefit the hearing-impaired. Consider vibrating bed devices, which can activate at the sound of traditional smoke alarms. Look for carbon monoxide detectors and displays for additional peace of mind. 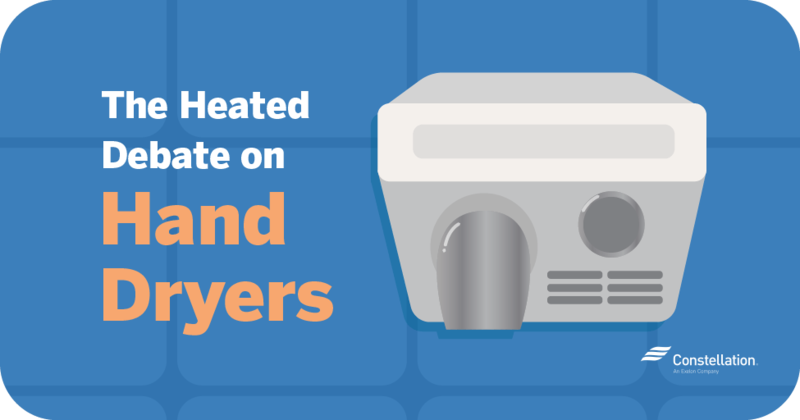 Carbon monoxide is a toxic fume produced by burning fuel in furnaces, automobiles, grills, fireplaces and other gas ranges, and affects more than 400 Americans a year. Carbon monoxide is odorless and tasteless, so it can accumulate in a home without the occupants’ awareness. Smart smoke alarms with built-in carbon monoxide detectors can alert you to this invisible threat. Look for smart assistant compatibility for seamless home integration. Many smart smoke detectors are now compatible with virtual home assistants, allowing you to check your alarms remotely and silence false alarms. Some models of smoke detectors also include built-in speakers, which you can use to listen to music, check the weather or communicate with other smart home devices in your home. Smart assistant compatibility also helps improve home safety for the elderly, as adult children can receive alerts from their parents’ homes, alerting them to potential emergencies. Use your voice to control your smart smoke detector. Ceilings are generally the best place to install smoke detectors, which often means homeowners may not be able to reach the silence button on the alarm. Some of the best smoke detectors will seamlessly connect to voice assistants, allowing homeowners to use voice commands to control their smoke detectors. That way, if a false alarm is sounding off, you can simply tell the false alarm to turn off without struggling to reach hard-to-access locations. Pro Tip: Checking the batteries of traditional smoke detectors is a chore—and it’s one that too many people forget about. If you need a reminder to check the batteries in your smoke detector, consider using Wi-Fi connected smart batteries in your alarms. Smart batteries will push notifications to your smartphone when alarms sound and when the battery charge is low, and you can even use smart batteries to silence false alarms. Knowing where to place smoke detectors is an important step in protecting your home. Smoke alarms should be positioned to minimize the risk of false alarms, and placed in locations where residents can hear the alarm from any room. If you’re unsure about where to place smoke detectors in your home, always ask a professional who can help with installation and determine the best locations for your home. Smoke rises, so smoke alarms should be installed on the ceiling or at high points on walls. This helps the alarm detect smoke and sound the alarm as quickly as possible. The NFPA recommends installing smoke detectors either on the ceiling, or placed one foot from the ceiling if you’re installing the alarm on a wall. If you have a pitched ceiling, or a ceiling with an angle, install the alarm within three feet of the peak. Smoke detectors need access to circulating air, so it’s important to not install the smoke detector in the top four inches of the peak. In every bedroom. Most professionals recommend installing smoke detectors in every bedroom to ensure everyone wakes up in the event of a fire. According to the USFA, most home fires occur between 11:00 p.m. and 7:00 a.m.
Outside each sleeping area. Although you may already have alarms in the bedrooms, installing smoke detectors in hallways and passages outside sleeping areas adds an extra level of security. If the bedroom alarm fails, the alarm outside the bedroom will still be able to detect smoke and wake people up. The kitchen. For proper smoke detector placement in the kitchen, place the smoke detector high on a ceiling or wall. The basement. 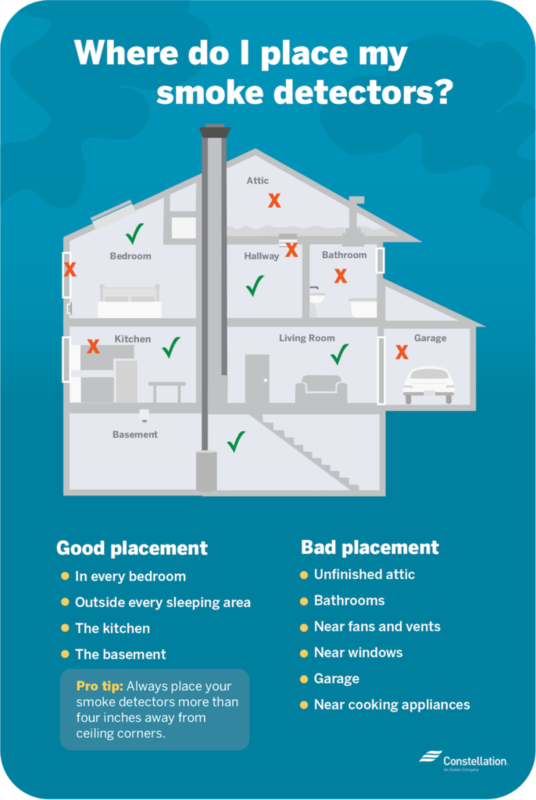 Proper smoke alarm placement should include at least one smoke alarm on every level of your home, and this includes the basement, which often houses a furnace or hot water heater—both of which can become sources of fire. Pro Tip: Knowing where to place smoke detectors is only one aspect of fire safety. Place fire extinguishers in the kitchen, rooms with fireplaces, the furnace area, the garage and the workshop. Fire extinguishers can be used to contain small fires or to clear an evacuation path. For large fires, evacuate the home immediately, and call 911 or your local fire department. Unfinished attics. 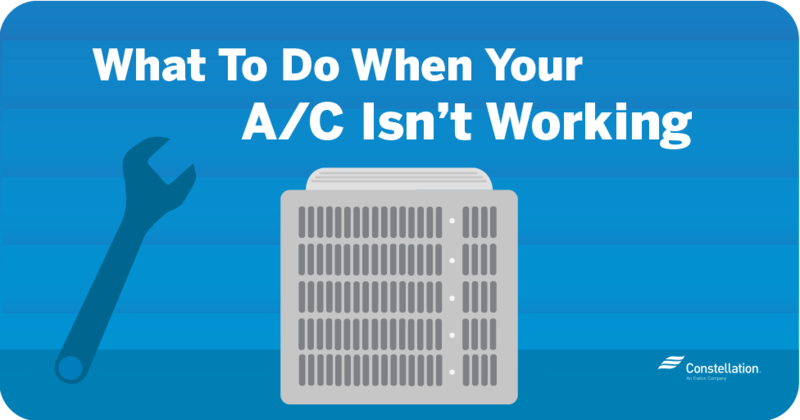 Many smoke detectors are not meant to work in areas of extreme heat or cold, and can malfunction or cause false alarms when exposed to attic temperature extremes. Within four inches of wall or ceiling corners. Ceiling and wall corners are areas of “dead air” where air circulation is low. Dead air can prevent smoke from reaching the smoke detector. Bathrooms. Steam from showers or bathing can set off false alarms. Near fans and vents. Fans and vents cause air circulation, and may trigger false alarms with fumes from other rooms—or worse, keep smoke away from the alarm. Near windows. Ventilation from windows can interfere with smoke alarm operation. Garages. Automobile emissions and household maintenance equipment can cause false smoke alarms. Instead, install a carbon monoxide or heat detector in the garage. Near cooking appliances. Don’t install smoke alarms within ten feet of the stove or any other cooking appliance in your kitchen to minimize false alarms. How many smoke detectors do you need in your home? Laws regarding how many smoke detectors you need to install in your home varies from state to state, but most professionals recommend an alarm in each bedroom as the bare minimum. If you have questions about how many alarms you need and where to place smoke detectors, contact your local fire department, or arrange for a fire inspection. A home fire is a potentially devastating event capable of causing extensive property damage and personal injury. As technology improves, smart smoke detectors are becoming the better choice when compared to traditional smoke detectors. 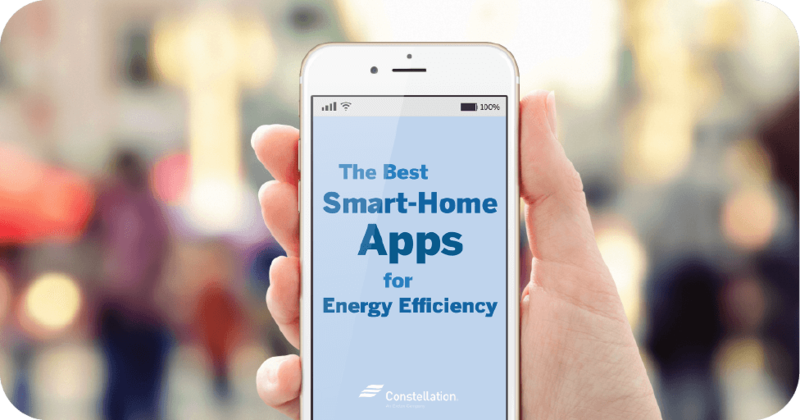 By choosing between hardwired versus battery smoke detectors, knowing where to place alarms, and connecting to home monitoring systems like Constellation Connect, you can increase your ability to act quickly and effectively to keep your home and family safe.